Specifically, the groups take issue with three amendments in the legislation which environmentalists say prevents the EPA from limiting carbon pollution and allows companies to emit unlimited amounts of carbon dioxide. “We want (Gerlach) to know and the public to know what he’s voting for and the threat he poses to people’s health,” Adam Garber, field director with PennEnvironment, said Thursday. Activists pointed out that pollution aggravates asthma. They explained that clean air regulations deliver a fantastic return on investment, with $30 in public health benefits for every $1 in cost to business. Finally, they urged Rep. Gerlach and his staff to consider our air and water as resources that we pass along to our children and grandchildren. His staff assured our activists that Rep. Gerlach thinks Congress needs to deal with our climate and energy challenges. 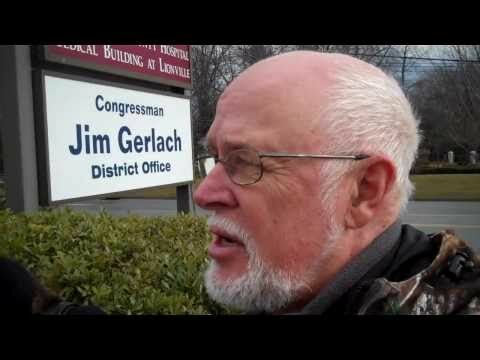 However, Rep. Gerlach voted against the American Clean Energy & Security Act and voted for the House Continuing Resolution that includes provisions to strip the Environmental Protection Agency of its authority to regulate climate pollution under the Clean Air Act. When they asked what Rep. Gerlach’s plan would be for curbing climate pollution, his staff didn’t have an answer.